Sixty designers took part in the fashion week (that ran from June 16th to 18th) showcasing their 2014 Spring and Summer collections. Topman Design followed up showing off the new color trend of the upcoming summer season: orange, but also a revamped cowboy look with satin rodeo shirts with embroidery, because Gordon Richardson, the design director, said he wanted the collection "to feel glamorous". MAN is the joint initiative between TOPMAN and Fashion East - a non-profit organization - and sponsors up and coming designers like Bobby Abley, a graduate of Ravensbourne College, who showcased a stronly medieval influenced collection with cartoon-inspired prints, a sort of Disney mixed in with Excalibur. While Alan Taylor, an Irish designer was slightly more refined. However he displayed a smack of wild creativity, with upside down coats fixed to pants, with the sleeves serving as pockets, and third designer, Craig Green had his models wearing layering, tie-die creations and 3-D cardboard constructions. Returning to London after several years of showcasing theBurberry Prorsum menswear line in Milan, Christopher Bailey presented his sober and elegant Spring/Summer 2014 collection, with just some touch of color. JW Anderson pushed the boundaries and raised more than one eyebrow when he proposed the man-halter - transparent and floral. Apparently it was a quest for a “ newness in necklines". 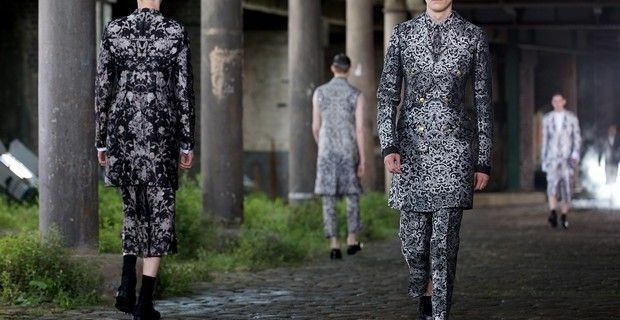 Sarah Burton’s latest collection for Alexander McQueen, that was held beneath a bridge in Kings Cross, was very much Edwardian inspired and featured faded fabrics, worn brocades, and tarnished buttons.